Explosive satire Ulster American has been called the most-talked-about – and divisive – show at last year’s Edinburgh Fringe. Raising timely questions in the #metoo era, it is expected to provoke equally fierce debates when it plays in Adelaide. Belfast-born playwright David Ireland’s Ulster American is set in an apartment where an Oscar-winning actor, an ambitious English director (both male) and a female Northern Irish playwright meet to discuss a play. 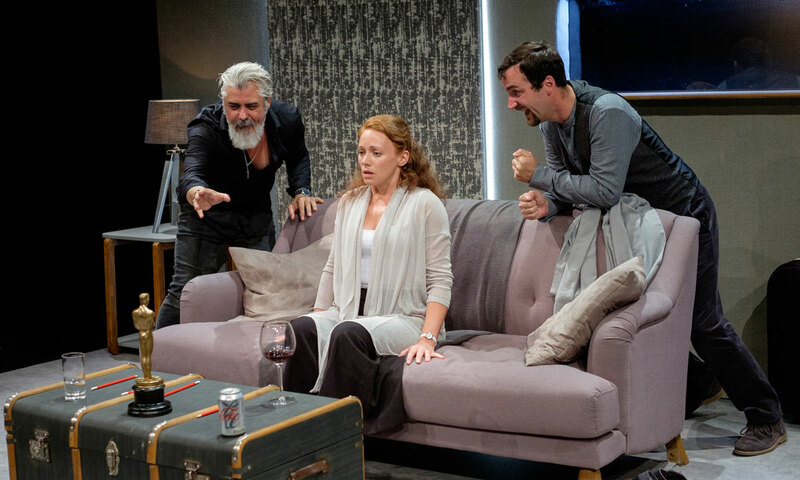 It sounds harmless enough, but their heated discussion quickly escalates to what is described by Scottish company Traverse Theatre as “a dangerous and violent climax”. Although Ireland wrote the script before the revelations about Hollywood heavyweights such as Harvey Weinstein which led to the #metoo movement, Adelaide Festival co-artistic directors Rachel Healy and Neil Armfield say it captures the contemporary zeitgeist with its questions about gender, power and ambition. They also believe it will make audiences both gasp and laugh. Director Gareth Nicholls, of Traverse Theatre, says it is a play that asks big questions. In this Q&A, he tells InDaily why Ulster American is both relevant and provocative – and responds to the comments from some critics that it goes too far. How would you describe Ulster American in just five words? Funny. Political. Provocative. Bloody. Brutal. You’ve been quoted as saying you can’t think of anything more vital or urgent right now – why is the play so relevant in the #metoo era? Ulster American deals with abuse of power, consent and male privilege. David Ireland [the writer] tackles these issues head-on with writing that’s witty, confronting and brutal, and creates a hilarious satire that exposes the characters’ grotesque nature in an utterly compelling and enlightening manner. What it has to say about power and entitlement in light of the #metoo revelations is fascinating – and I’m sure it will provoke some fierce conversations long into the night afterwards. What are some of the big moral questions it raises? It asks how far we’d go to get what we want, when we should or shouldn’t call out the actions of others, and under what circumstances. It questions context and what effect that has on what we can or cannot say. And it explores the line between thinking something and acting upon it – and where on that line our judgment should sit. Given that the play is so uncompromising and controversial, even brutal, how challenging has it been bringing it to the stage? We’ve been incredibly rigorous with what the piece is saying politically and culturally, spending a long time testing each and every word and its implications within the story – so while that’s taken time, it has also been an incredibly rewarding process. That said, we’ve also got an outstanding cast with actors at the top of their game and David has written something that, while uncompromising and controversial, is also extremely funny and witty – so staging it has been a bit of a joy as well. While many critics at Edinburgh awarded it four or five stars, others argued that one particular conversation, about sexual assault, goes too far. As director, what is your response to those kinds of comments? I think everyone is entitled to their opinion and I’d invite anyone who’s unsure to come and see the work for themselves. We’re of course aware that what is said by one of the characters is deeply disturbing, but it’s vital that it’s taken within the context of the drama. The comment you’re referring to is made at the beginning of the play but is confronted and forcefully challenged in the play’s latter stages. Ulster American is a challenging satire that exposes the hypocrisies and ritual abuses of those in power, so while the content might shock some, audiences will see why it is included. What range of reactions has Ulster American elicited from audience members? The response was pretty phenomenal. We had standing ovations at every show; the press, reviewers and bloggers discussed the piece for weeks on end; and tickets became a bit like gold dust. Ultimately, as you point out, it is a satire – so how funny is it? Ulster American will be presented at the Dunstan Playhouse from March 13-17 as part of the Adelaide Festival.